The four best european teams will meet in Malmö/Sweden to find the European Champion 2005. 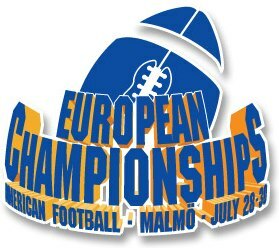 This summer SAFF is organizing the eleventh European Championship in American football. Apart from the hosting country, Finland, Great Britain and Germany have qualified. In addition 11 other countries took part in qualifying matches leading up to this Championship - this is a record number of participants!! The last Championship was held in 2001, Germany are the reigning Champions beating Finland 19-7 in the final. The town of Malmö is honoured to be hosting these Championships. We hope that you will use some of your vacation for a long weekend in Malmö to follow the struggle for the medals by Sweden and the other three countries. Will this be the first Championship where blue and gold win a gold medal despite the razor sharp competition? Our arch rivals Finland have already won five gold medals, Great Britain and Italy have two gold medals each and Germany has one gold medal.